. Published on January 12, 2011 . Due to (many, MANY) requests, I have been asked to post a tutorial on how to make a Gir cake like the one I posted before. Luckily, I have a great friend who’s daughter NEEDED a Gir cake for her birthday so now’s my chance! I will try and post as much information as possible but please just go for it! Do your best and just have fun with it If you enjoy the process, you’ll enjoy the cake even more. 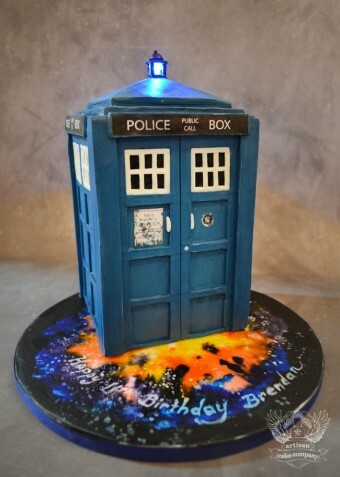 You can make this cake! Step One: Bake Cakes! You will need two 6″ square cakes and two 8″ square cakes. You can do a round or big sheetcake if that’s all you have but this is what I used. Don’t be worried about the recipe of cake you use as long as it’s nice and has had time to cool! I usually bake my cakes the day before. Let them cool COMPLETELY before wrapping them in plastic wrap to set over night. I do not refrigerate as this dries them out. Stack your cakes on top of each other without buttercream and place the larger cake stack at the top for the head and the smaller cake stack below for the body. Put these cakes on a large sheetcake-sized cardboard. 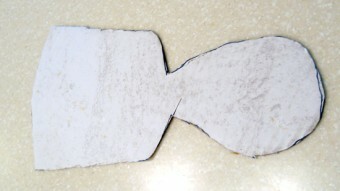 Start shaping the head by trimming the bottom corners down to make it shaped more like Gir. Start trimming the body and rounding out the belly. Keep in mind Gir’s head has a little roundness to the front and isn’t flat. The top of his head and bottom is rounded as well. In hind sight, I think I should have made Gir’s head a little shorter but I was TRYING to think about photos and tutorials lol Make me proud and do better, he he. Step 4: Time to split the cakes! 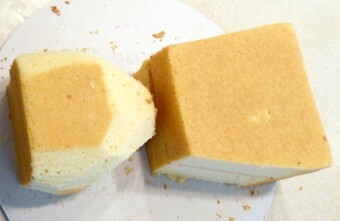 Cut the bottom cake in half by holding a long, sharp serrated knife level and cut slowly. Let the knife do the work! 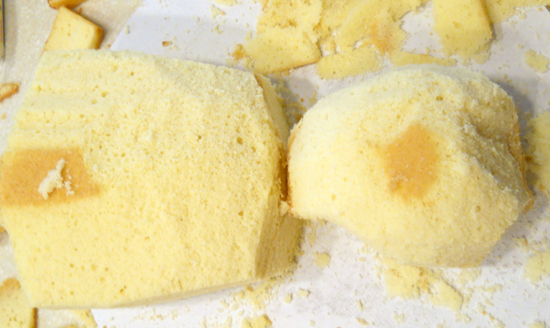 Because we carved the top cake a lot in the shaping process, we don’t need to split that cake. You should have three levels of cake now Split the head and the body. Step 5: Fill the cakes with yumminess! I am going with a strawberry puree but you can fill with whatever you like. 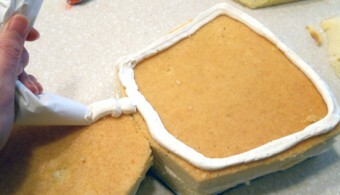 If you do use a filling make sure you dam the cake with a bead of frosting so the filling doesn’t squish out. Also don’t use too much! A little goes a long way. You can also just do buttercream for filling. I use a parchment triangle for filling but you can use a plastic baggie with the corner trimmed off to do a buttercream dam. Place the middle layer back on and fill the same way. Place the top layer on and now we’re ready to crumb coat! Step 6: Crumb coating. This is essential for sculpted cakes. 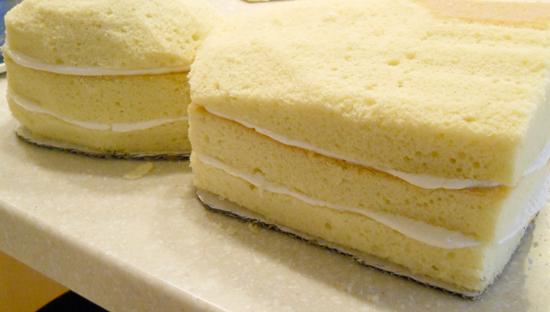 It is a thin layer of buttercream applied to the cake and then chilled. This seals in crumbs and allows for a clean look when applying the fondant. Here is a short video of me crumb coating the gir cake after it has been filled. Place back in the freezer and chill another 10 – 20 minutes. Step 7: Details. While the cake is doing it’s final chill, take your black fondant and make some arms and legs. I add tylose so that they dry stiffer but it isn’t necessary. Form some antennae and trim the edge flat. Insert the lollipop stick into the antennae. You also need to make a zipper, eye lashes and a nose. If you feel like it would be easier, you can do this after you cover the cake in fondant so you can compare what you are making to the cake to make sure the details are not too big or small. 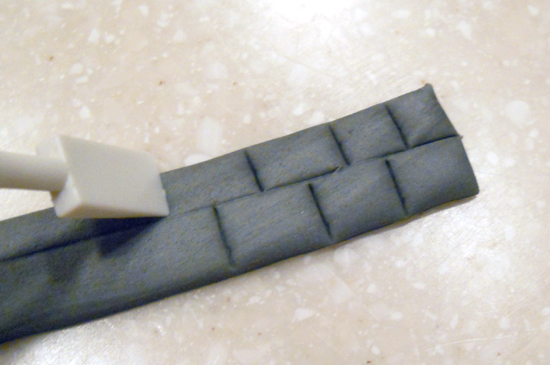 Use your flat edged tool to make the zipper pattern. Step 8: Fondant! Right before you take out the cake, roll out your green fondant. Shoot for too big rather than just big enough. 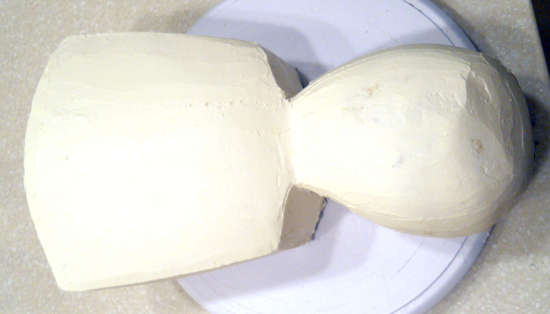 The bigger the piece, the easier it will be to get the folds out of the fondant around the edges. Try to roll the fondant out to about a quarter inch thick so you don’t get tears but you don’t want it to be TOO thick or it will be hard to cut. Here is a video of me covering Gir in fondant. I roll the fondant up onto a tube and then drape it over the cake. Usually, I just pick the fondant up and place it on the cake but rolling the fondant up onto a tube will probably prevent tearing for beginners. Use your fondant smoother to get out all the lumps and bumps. Fingers leave fingerprints! Step 9: More Details! 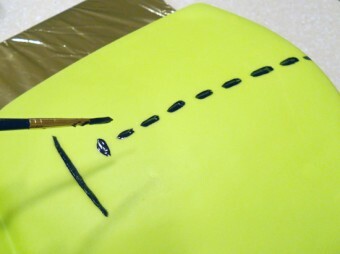 After your cake is trimmed, roll out a piece of green fondant into a rope. 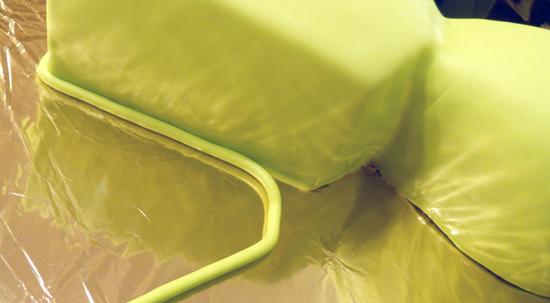 Place around the bottom edge to hide the rough edges. Paint on the stitch-marks and mouth-line with the black food color. Cut out a tongue and glue on the rest of the facial features with a small amount of water on your clean brush. Put the antennae in as well as the zipper and lastly, the arms and legs. 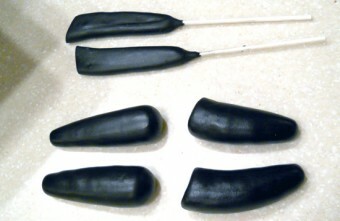 These stick better if you wet them lightly and then allow them to become tacky before attaching to the body. Smoosh edges down to make it secure. Personalize the cake with some rolled out white fondant shaped as a talk bubble. Remember to wipe off all those fingerprints BEFORE you take a photo (unlike me) ha ha. I hope you found this cake tutorial helpful and I would LOVE to see photos of your finished cakes! Good luck! 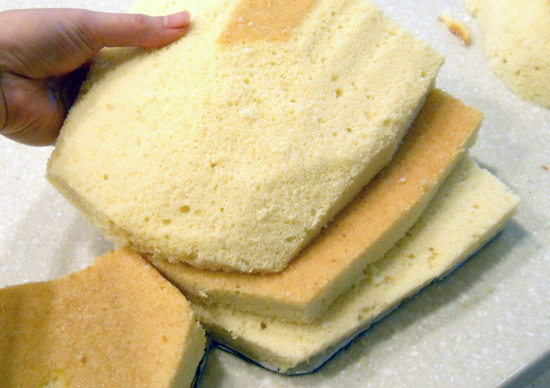 Im going to be making a simular cake but i want it to be sitting up right how would i stableize the cake…..
Wow! This cake is amazing. I really want to try and make it now:) Thanks for the brilliant tutorial, the videos were really helpful. 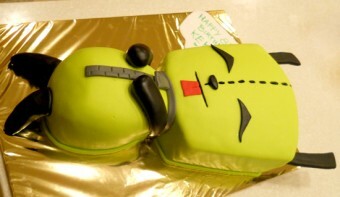 I’m going to make this cake for my son’s 12th birthday in December-he is a mad keen Gir and Zim fan-hopefully it turns out ok-fingers crossed! Thank you for the great tutorial! OMG! Thank you so much! This was amazing. My birthday is in exactly 13 days ands I am totally making this for me! 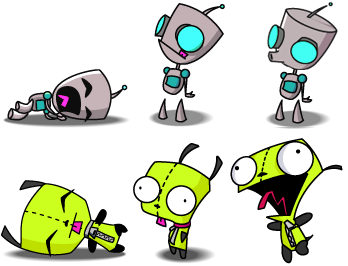 I love gir so much! I asked my mom for the cake but she said no…:( but now thtat I found the recipe, I can totally make it! THNX LIZ! Thanks so much for sharing!! My daughter will LOVE this one!! Do you think it can be made with ice cream as well? I may try both! Omg! 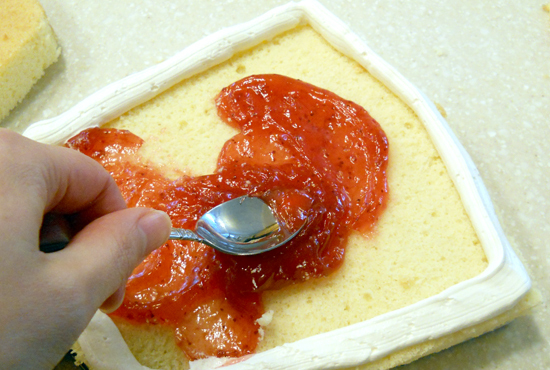 I <3 how you gave step by step instructions on how to make this cake!! I made this cake for a friend where cani send you a pic of the results? Also i would like to suggest if u could make gir cupcakes and a domo cake?!! Glad to find this site. 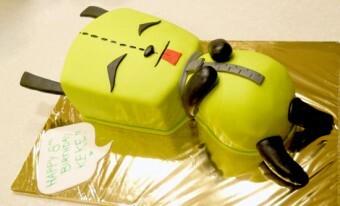 Have to make this cake for my grandsons 21st birthday and had no idea who Gir was or looked like. Yhank-you so much for the info. Foolish human pig smellies, I SHALL RULE YOU ALL WITH MY IRON FIST! Well! Tomorrow I’ll be taking a whack at this. Never made such an elaborate cake but you’ve made this step by step and I think I can do it my daughter turns 12 on Wednesday and is a HUGE invader zim fan (my fault xP she gets it from her mommy ) anyways, thanks so much for the tutorial. Here’s hoping!!! I’M A GONNA HUUUUUUG YOOOOOU!!! sooooooooooooooooo cute!!!! iLOVE gir. he is so AWESOME and we like the same things. i want my ARTISTIC MOM to make it for me!!! :) wish us luck!!!!! I’m trying to get this for my goddaughter’s 13th bday but no bakery will make it in Columbus Ohio. Anybody know anybody who can? gir. . . is. . . my. . . life! i own all seasons of invader zim he is SO cute an AWESOME i love the 1 episode where he sing the doom song . I really want that cake! BADLY!!!!!!!!!!!!!!!!!!!!!!!!!!!!!!!!!!!!!!!!!!!!!!!!!!!!!!!!!!!!!!!!!! Gir: you gonna make biscuits??? You gonna make biscuits??? Youuuu gonna make biscuits??? You gonna make biscuits? Dez: no, Gir. I’m gonna make a cake… Of youuu!!! Gir: I know what you mean. I WILL make this cake for my birthday in July! Please keep this tutorial up! My very close friend LOVES Gir and Domo! It would be so cool if you could make a Domo cake for me please! Thanks! Piggy why I loved you! I am turning 14 on march 7th and I have loved girl since I was little! OMG THANK U SOOOO MUCH MY BIRTHDAY IS COMMING UP REALLY SOON SO I WANTED THIS CAKE FOR MY PARTY BUT MY DAD SAID NO BECAUSE WE DIDNT KNOW HOW SO YAY!!! NOW I DO THANK U FOR SAVING MY B DAY CAKE IDEA AND FOR MAKING THIS THE BEST BIRTHDAY EVER!!!!!!!! I am in love with your skills! Cant wait to try to make this ^_^ Thank You! Thank You! Wow, I for sure want this. Woah, I really want to try to make this one day. Maybe even this year or something for a friend’s birthday. Though, I have no skills in baking what-so-ever, so I’ll have to find assistance. 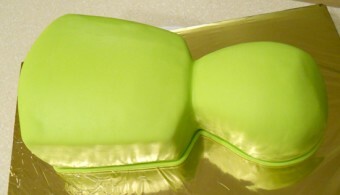 You’ve also inspired me to learn to bake so I can practice making shaped cake like this. Thank you for making this wonderful tutorial! This cake is so amazing! omg i luv it and needz one uv these 4 my bday GO GIR!!! where did you get the greenish cover? and was it edible paint? I am the biggest gir fan in the world!!!! I want this cake for my bday! that looks awsome!! 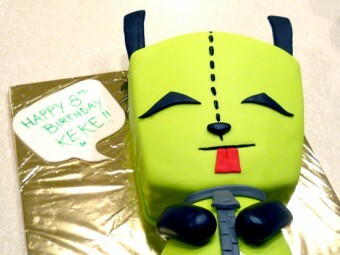 im looking for a gir cake for my birthday and this is the best so far! but my mom says no -.- to much mess. i have tons of pics of gir and my mom says to take one in and show the cake maker people. NOT FUN! this was for my 22nd birthday, kinda messed up but it tasted great!! wow that looks freaking sweet!!! good job! where did you get the lolipop sticks? How long did iy take you? can you make a video for this? This cake is fantastic-thank you so much for the tutorial! My kids recently got hooked on Invader Zim via Netflix and my son requested this cake. One question-does storebought or traditional fondant have an advantage over marshmallow. I’ve been using marshmallow recently because it is so easy and cheap, but I’ve never tried traditional fondant (costly and I heard it doesn’t taste too great). Any pointers? I would say that marshmallow fondant tastes 100% better than store bought and is cheaper. The only advantage store bought has is the convenience. 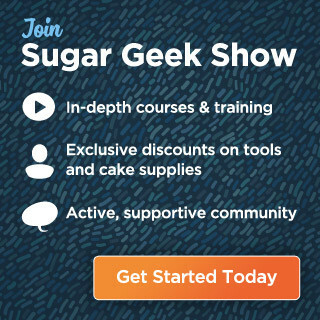 I make all my fondant but it can be tricky if you don’t know what you are doing. I say if you can make it, then do it! Way better than store bought I do add just about 4 oz of store bought fondant to my MMF to improve elasticity though. I also tend to work with my MMF slightly warmed in the microwave. It actually works better that way. Have fun! 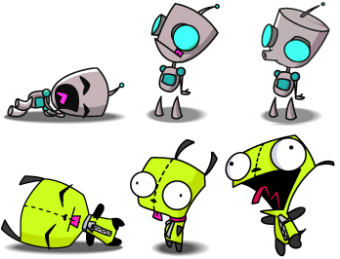 i am watching invader zim rite now while looking for gir cakes im trying to convince my mom to get me one for my birthday haha and now she can make me one instead of buying one thanks alot your work is amazing!!!! I gonna make a cake like this for my sister who is turning 14 in august! oh brittany you don’t need to post on mean comments! Thank you sooo much for this tutorial!!!! My daughter loves Gir and asked for a Gir cake for her birthday. I honestly don’t even know much about this Gir character to begin with, let alone what he looks like. This will be a HUGE help in making my cake!!!!!! Thank you soooo much!!! How can I get this cake for my ex-girlfriend!!!! Plz E-mail me Luislinkandzelda@yahoo.com!!!!! This was a great toturial. Easy to follow directions. My son loved this cake I made for his 15th birthday. I loooove gir i did one and it turned out great! i JUST DID THIS CAKE FOR MY DAUGHTER’S 13TH BIRTHDAY AND SHE LOVED IT! THANKS!!! Oh Thats beautiful can you make a adventure time cake tutorial my daughter wants one for her birthday but they don’t sell them in stores. I LOVE adventure time! I should totally do one Thanks for the suggestion! Thank you! Thank you! Thank you! I used your fabulous instructions as a guide for a Gir cake for my sweetie’s birthday and it turned out really well! Especially since this was my very first attempt at anything involving carving or fondant! So again, thank you! I just made this gir cake for my step daughter. She loves gir. I am sooo happy it turned out pretty good for my first shape cake tommorow i atempt the princess castle cake found on betty crockers website. Oh and my local store didnt have red or black fondont so we used black frosting for his zipper and eyes and we used yellow fondant for his ears and arms and painted it black w a paint brush i hope that was helpful. Thank you, thank you, thank you for posting up the how tos! I have a set of twin nieces with a birthday coming up….i had no idea who Gir was till now. They LOVE this character! They saw this cake….and wouldn’t ya know it…it’s what they want me to create. This will be my 1st shaped cake that i must cut out and shape myself. I have done character cake pans before, but nothing like this…..i am extremely excited to do it. I never knew gir till today hes adorable I love his videos I lerned the the doom song too im begging my mom to buy me the bed sheet and cake 4 my b day and make me som pictures ahh and my room will be all gir!!!!!!!!!!!!! !I NEED GIR I LOVE HIM SOO MUCH!! 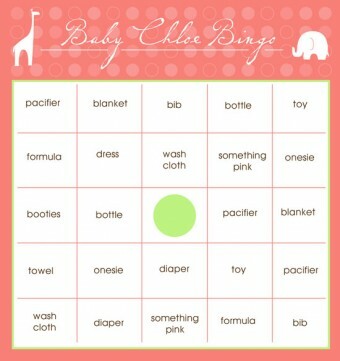 I’ll pay any one of you quys to make this for me! 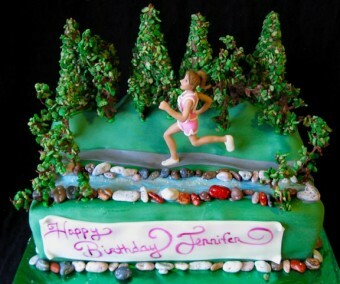 awsome:)thinking of having one for my bday is it a regular person have to do it or a bakery? it looks so good i think i mite make it my self and if it feeds that much im diffently going to make it pluse girrr is my idol. It came out really nice! how many does it feed? This is an absolutely wonderful tutorial. I’m attempting a Gir cake for my 15 yr olds birthday. I’ve never worked with fondant at all before so I will need to do a bit more research before I make the cake! Thank you so much for the this though! Thanks to your tutorial the Gir cake that I made yesterday and today was a BIG success! I welcome you to go to my facebook page to see the finished product. (don’t know how to submit a picture to you) Thanks again! Oh my gosh I wish you could make me one for my birthday. I would die for a cake like this! This is so freakin awesome!!!!!!!!!!!!!!!!!!!!! Good job we love it!!!!! My kids loves Gir, do u think can i also do with pastry cream? yes you can make with pastry cream but don’t use too much or it will ooze out Have fun! Great! Do you have any photos? I’d love to see! hi! im a kid that loves to watch this show. I asked my mom if i could have this cake for my graduation party at my house. SHE SAID YES!!! i cant wait to try to make this!